Most Epcot restaurants participate in the “Candlelight Dining Package.” Christmas in Orlando would not be complete without this tradition. A wonderful tradition started by the family of Kelly’s good friend Tiffany. Kelly and I pick out one of the Disney World Restaurants each year to have dinner and then enjoy the free seating for the candlelight procession. This year we chose to dine at Restaurant Marrakesh. Upon our arrival at our Epcot restaurants we were greeted by the smiling young girls at the desk. I immediately explained that I write to my readers about the restaurants where I eat. I wanted to be sure to get some recipes since mine on Moroccan dishes are very limited. Quickly I was greeted by the very nice and enthusiastic manager, Abdou. While we were shown to our table by the hostess, Abdou disappeared. Soon he found us at our table, not with the two requested recipes, but with a whole cookbook from the kitchen of Restaurant Marrakesh. How nice is that? The cookbook “Morocco”, given to me by Abdou, is a great introduction the culture of Morocco besides having traditional recipes. (It is available for sale at the Epcot restaurant) Mealtime is more of a ceremony rather than a necessity. No matter how simple a dinner invitation is it will always be presented like a feast. The food is always prepared in abundance but nothing is wasted. Extras are giving to family and friends in need. There is a great diversity in ingredients and spices in the Moroccan culture. Lamb is the preferred meat selection and pork is prohibited. 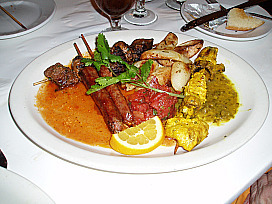 Cous cous is the national dish, but brochette is also very popular. 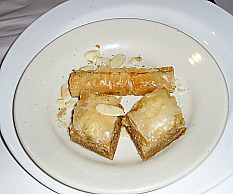 Most pastries are made with almonds and honey. The use of many wonderful spices and herbs is quite apparent in the delicious flavors of the food. Epcot Restaurants package deal includes an appetizer, an entree’, a dessert and a non-alcoholic drink. After dinner you get reserved seating at the “candlelight processional” and pre-arranged “Illumination Reflections of earth viewing”. (fireworks) I try to do this every year. It is truly the highlight of the Christmas season. After meeting our waiters, Mustapha and Biga at Restaurant Marrakesh and reviewing the menu, I chose the “Marrakesh Feast”. This included Harira Soup, Beef Brewat Roll, Marrakesh Mix Grill with roasted potatoes and assorted pastries for dessert. I have eaten here several times, although always very good, I must tell you that the food has improved more. 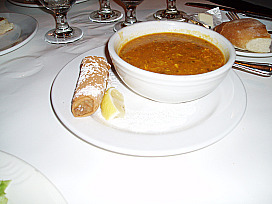 The hearty soup was full of flavor from spices and the brewat was very delicious. I am so happy that both of these recipes are in the cookbook to share with you. The rest of the food was also very good, but I began to wonder about the “belly dancer” entertainment. I asked the waiter and he assured me that she would be performing. Within minutes she appeared and the music started. She always selects children from the crowd to dance with her. I love watching the children dance and actually they are usually very good. This was a great time! Now it is time to go to the candlelight service sponsored by Epcot Restaurants. Add all ingredients in a Dutch oven and cook at a slow boil (on medium low) for 1 ½ hours. Reduce stock to ½. Make a roux of 2 parts flour and 1 part water to add to stock to thicken. Add more if needed. Cook for 10 to 15 minutes. Mix above ingredients and brown. Wrap 1 ounce meat in a bastilla leaf. (similar to Phyllo pastry) Deep fat fry. Sprinkle with powdered sugar and cinnamon. Now for the other part of Epcot Restaurants package deal; the candlelight service. After a short wait in line, we were seated in the American Gardens Theater. Words cannot describe this program. I can only say as many others have said, “chills go up your spine.” The cast for this presentation include Walt Disney Worlds Cast Choir, The Voices of Liberty, Walt Disney World Orchestra, Walt Disney World Conductor and music director Mr. Rick Mizell. That is still not all! A fifty piece orchestra and a massed choir, all carrying lighted candles, accompany the joyous retelling of the birth of Christ by a celebrity. Our evening it was wonderfully told by Andy Garcia. Put this all together with the lighting effects and it is one magnificent experience. The evening ended with the fireworks extravaganza. There is none other like Walt Disney World. Set aside rice, almonds and raisins. Combine all other ingredients in Dutch oven and bring to a boil on top of stove. Remove from heat and stir in rice; cover and place in preheated oven at 350F degrees. Bake 15 minutes; remove from oven and let set covered for 5 minutes. Fluff rice with fork and stir in raisins and almonds. In large heavy skillet brown lamb in ½ cup olive oil. Add 1 quart water and bring to a boil; simmer covered for 1 ½ hours. Try this flavorful and delicious lamb stew recipe; it has many of the wonderful flavors like the ones served at this Epcot restaurant. Brown lamb in 1/2 tablespoons of olive oil in a large Dutch oven. Remove meat from pan onto platter. Add remaining olive oil; brown chopped onion and garlic. Cook onion until tender; add parsley, whole gloves, ginger and saffron. Return meat to pan; add bay leaves, salt, pepper and tomatoes. Brown onion quarters in 3 tablespoons of butter over medium heat until light brown; set aside. Cook almonds in remaining 1 tablespoon of butter over medium heat stirring until light brown. 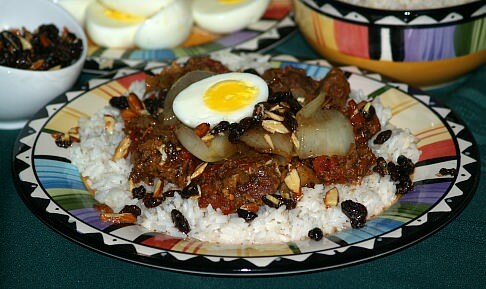 To serve spoon stew over rice, top with cooked onion quarters, almond raisin mixture and half of egg.